NO MORE CHASING THE SHADE! Ultra LIGHTWEIGHT - 5 lb - 7 foot umbrella, fiberglass spokes and steel pole. The ezShade is the ONLY Umbrella and Sunshield Combo that blocks over 99% of UVA/UVB rays, DOUBLES your SHADE and keeps you COOLER. Did you know that up to 1/3 of CANCER causing UV rays can reach your skin while you are sitting under a basic umbrella? That is due to reflected UV rays that bounce off of things like sand, water and concrete. The researchers of this study concluded that shade structures with side-on walls or other side protection provide the greatest shelter from the reflected UV rays. The ezShade is the only umbrella and sunshield combo that helps to block those reflected UV rays. The ezShade Sunshield attaches anywhere along the bottom edge of the ezShade umbrella. Multiple panels can be added to create a portable privacy enclosure. 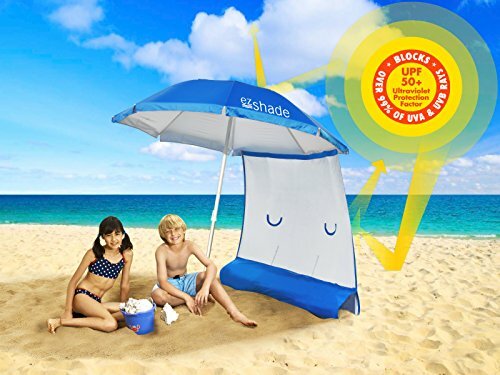 Weight bottom pocket with sand, water bottles or other lightweight objects to keep your ezShade Sunshield from blowing in the wind. Invented by a mom. Endorsed by the Melanoma International Foundation and Winner of the Huggies MomInspired Grant Program. If you have any questions about this product by ezShade, contact us by completing and submitting the form below. If you are looking for a specif part number, please include it with your message.